Earlier today, Bandai Namco announced that their upcoming remaster of Tales of Vesperia is also getting not one, but collector’s editions. One of which looks really damned cool. Dubbed the Tales of Vesperia: Definitive Edition Premium Edition, this thing has a bunch of cool stuff that would look really nice on my shelf. I mean, in anyone’s fantastic gaming collection. But really, on my shelf. Sure, it’s got your staple of things that most CE’s have, still this one is really impressive. Why? Because it has a damned steelbook case with a cool wolf with a scar on it. They had me with a steelbook, but then they had to make it look all badass. But enough about that, let’s see what’s in this definitive edition, shall we? It’s currently $100 and available for pre-order here. Now for the good and bad news. The good news is that you can pre-order this right now on the Bandai Namco online store. The bad news is that this isn’t coming to North America. 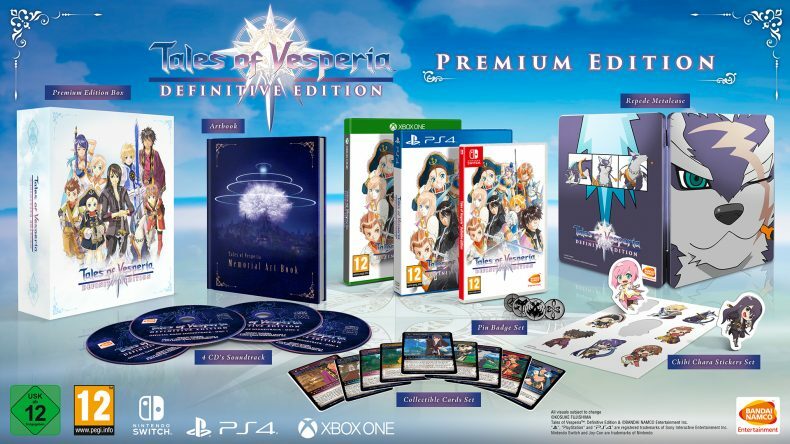 Instead, we get Tales of Vesperia Anniversary Bundle, which doesn’t look as nice and misses out on everything except the steelbook case and artbook. It also costs $100, in case you were wondering, and also available pre-order. Seriously, why does North America keep missing out on the cool stuff? Now, as for the game itself, Tales of Vesperia: Definitive Edition is also pretty interesting. Not only does it include HD visuals, but it also includes a bunch of gameplay elements such as new events, characters, and costumes that didn’t make it over in the North American release. So even if you’ve played this before, now you have any more incentive to play it again. Tales of Vesperia: Definitive Edition will be available for the PS4, Xbox One and Switch on Jan. 11, 2019.